If you want a little more elbow room for writing your WordPress posts and pages, there are four easy ways to change the size of your text editor or your entire composition page. Following are the simple instructions with screen shots to show you how to get all the room for writing you need. One of the easiest ways to get more room for all of the modules on your admin pages, including the text editor, is to collapse the left sidebar of Admin links. Simply click the the little arrow at the bottom of the sidebar. Now you’ll only see icons, as shown on the left. If you want the full text link look back, just click the arrow again to expand the sidebar. If your text editor is usually the size you like, but you need a little more room for the post you’re currently working on, it’s easy to resize to suit. Look in the lower right corner of the text editor module and you’ll see drag lines as show at left. Hover your cursor over the corner and it will change to a two-pointed arrow. Simply click and drag the editor to the desired size. If you always want more lines to work with in the text editor, you can easily select a new default setting. Go to Settings > Writing. At the top you’ll see a setting for “Lines of the Post Box”. Input the number of lines you would like to have as the default. If you don’t want any of the usual WordPress admin icons distracting you from your writing, you can put the text editor in full-screen mode. 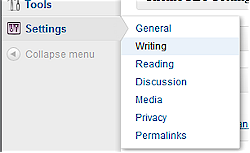 While in the text editor, click the Full Screen icon, shown at left. It’s next to the last one on the top row of tools in your text editor. You’ll see a toolbar at the top and a dotted area around your title and content area. When you start typing, all of that will disappear and your page will look very much like a clean document processor page. To see the toolbar again, just hover your mouse near the top. Just hit the Esc key on your keyboard when you’re ready to return to the normal view. Some folks enjoy using the distraction-free mode in WordPress to create drafts of future posts instead of using a document processor. The main reason is because the WordPress Dashboard (get link to vid tut) has a module that shows Recent Drafts. That way, the writer can constantly be reminded of drafts that are available for completion instead of keeping them in a folder on their computer where they are out of sight, out of mind. The caveat is search engines will eventually index those drafts. It may take several months before that happens, but something you definitely want to keep in mind. The WordPress text editor is not a document processor. It’s an HTML code generator. Because most folks prefer to work in the Visual View Mode, they forget about all the code that is being created in the HTML View Mode. In my opinion, the text editor is the bane of WordPress. Even if you use a better text editor plugin, like TinyMCE Advanced, when you do a bunch of editing you’re likely to leave behind code orphans. Some browsers ignore them while others do not. Those usually cause extra spaces and funky formatting. Do you create your drafts in WordPress? Have you customized your text editor? WordPress Video Tutorials library and in the one-on-one BlogAid Training Classes. As usual, I am way behind the curve. I knew about one but not all four. Thank you. Clair, since so many different folks like different things, having more options is good. I usually set mine to about 20 lines and then just drag it down on the occasions I need a little more, such as embedding a video. Thank you MaAnna for another well written article. I appreciate your sharing this in the WordPress LinkedIn.com group. Glad you enjoyed it Peter, and thank you for taking the time to comment here on the blog. I’ve picked up so many useful tips in that LinkedIn group. It has turned into a super resource for even seasoned folks. There are just too many options for any one person to have tried them all.